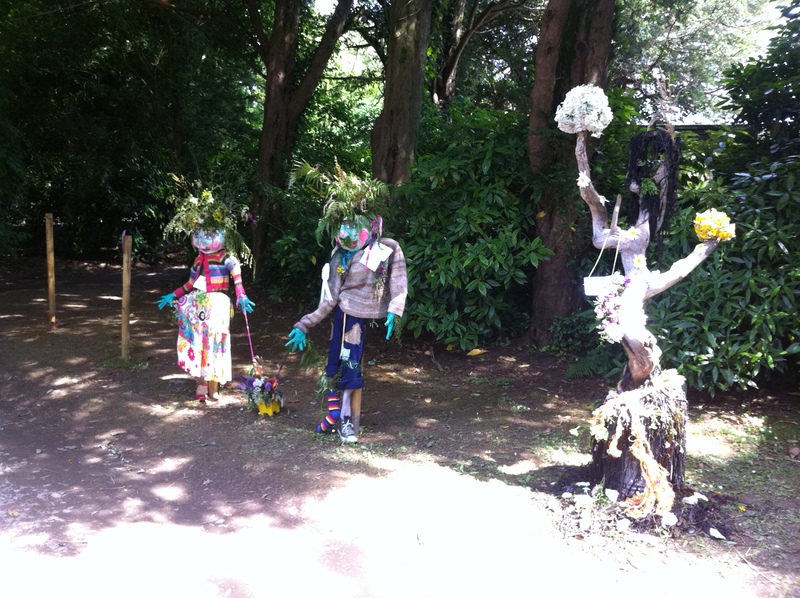 I’ve just returned from a three-day visit to the Port Eliot Festival, in St Germans, Cornwall. It’s hard to put into words just how good and right the place and atmosphere felt. On the last stage of the drive you wind through a series of roads that alternately give views across small fields that are bounded by lines of uneven, tangled hedgerows, or pass through green tunnels formed by the trees on either side bowing down to meet in the middle. If it wasn’t for the tarmac you could almost believe that you’d accidentally trundled into an ancient Holloway. ‘Wow’ my two-year old son said every time we passed through one of these tree tunnels and we had to agree. It’s the kind of landscape that has been lost to many parts of England, where agri-business doesn’t tolerate hedgerows and twisted old trees, preferring to deal in vast empty expanses of land that can be easily and intensively worked. Once we’d arrived and set up our tent – during the only rain that fell for the whole time we were there – we went for a walk. 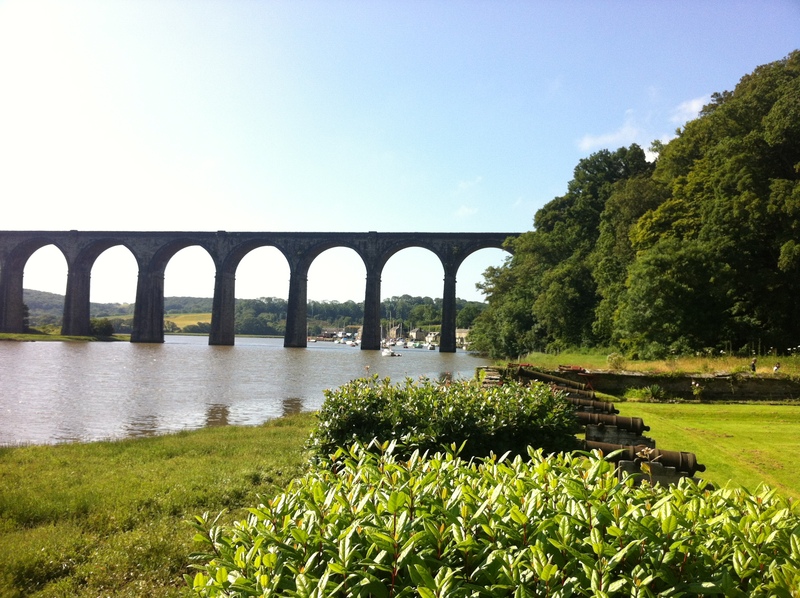 Moving through the campsite, festival marquees, caravans and stalls we eventually wandered over the brow of a hill, where we found a maze and beyond this a view of the Lynher estuary with a railway viaduct stretching over it. At this point a train sped over the top, bringing another ‘Wow’ from our son as it passed. The viaduct – built by Isambard Kingdom Brunel for GWR – looks like something from a John Sell Cotman watercolour. From our vantage point amongst ancient Yews, Pine and Oaks, it felt a little like being awake inside your own dream. Even with dozens of mosquito bites and photos as evidence that we were there, it’s difficult not to shake my head a little and wonder if I hadn’t encountered the Cornish equivalent of the house and grounds in Alain-Fournier’s Le Grand Meulnes. And that’s just the setting. The festival itself is one of the best organised I’ve ever been to – lots of stewards, people on litter duty out early, not much queuing for the bars or food stalls. There was a packed program of literary events, music, talks, walks, readings, poetry, flower shows, interviews, master-classes, quizzes, DJs, art displays and classes, fashion, children’s activities and a knitting circle. In between general ambling about, the three of us crammed in: painting and claiming an elephant (which became part of a parade), Beth Orton, a discussion and live audio experiment with Robert Macfarlane, The Bees, Daddy-Lion face paint, pints of cider and Tribute ale, mobile disco, Busk Stop watching/listening, completing the maze, exploring Nik Elvy’s Cabinet of Curiosities, a bird song quiz, dancing in The Rubbish Little Disco, Flats and Sharps and a dash of The Egg, a whizz round the church, a Paul Simonon exhibit in the basement and one and a half gigs by Mik Artistik. The last are a vastly energetic, eccentric band from Leeds who’s signature song ‘Sweet Leaf of the North’ is all about a leaf that got stuck on their windscreen whilst driving down from Yorkshire to play a gig in London. I stumbled across them on Friday night, intending to give them a song or two before heading elsewhere and ended up staying for the entire, slightly mad, set, then watching them again the next day. Exactly the sort of band that a good festival enables you to discover. 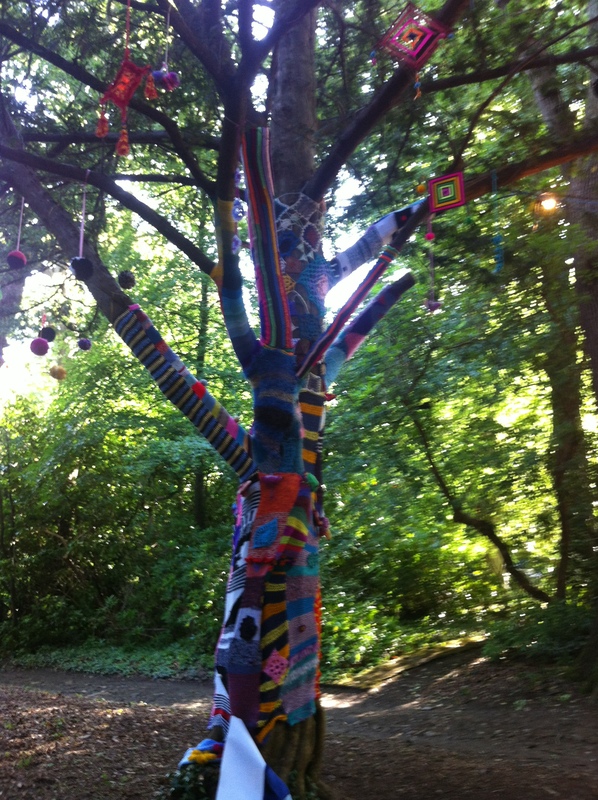 For me the trees of Port Eliot provide a lot of its magic. There are hundreds of them, tall and old, lots of them gnarled, covered in ivy and heavily mossed. One was dressed in hippy-garb and hung with patterned material. At night some trees are lit with strings of bare light bulbs, so that walking the wooded paths in the dark has even more of a fairytale quality than during the day. But if you can resist the lure of the sylvan inhabitants, there’s a beautiful boathouse, a walled garden, an orangery, 12th century church and the house itself, a former priory, to get your Romantic juices flowing. If you ever think about going to the Port Eliot Festival and you like books, or music, poetry, food, grab the chance and go – or if you prefer less company, visit the grounds and explore them for the day – they’re open to the public between March and July – You won’t regret it. 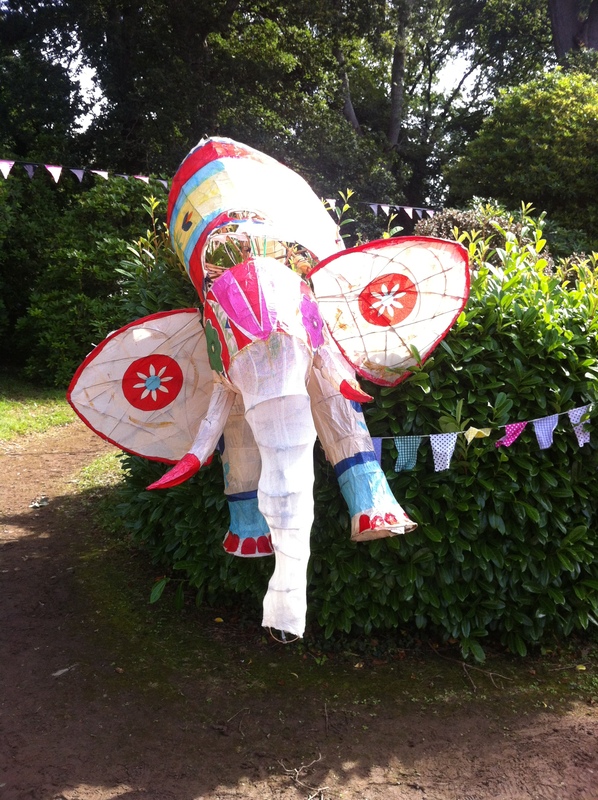 Thanks for a great write up of Port Eliot Fest. It’s definitely a space outside of the real world! So much to see and do, we didn’t manage a hundredth of it! But spent time knitting in DoveGreyReader’s tent in the Walled Garden, which was the main reason I wanted to go. Just watched the vid you posted a link to of Sweet Leaf of the North. OH will be interested to see that I think – he’s one of the ‘oldest rockers in town’ here in Liverpool, I wonder if Mik Artistik ever do gigs over here! I bet your 2 year old son had loads of fun. We have 2 years old GrandTwins, and I just wished we’d thought to try and persuade their parents to take them.. They’re holidaying in Cornwall this week! Ah well, in 2 years time maybe! Best wishes from Liverpool, Maggie. Glad you liked the write-up. Looks like Mik Artistik get around a fair bit, so you never know you might catch them in Liverpool one day. Cheers.